Oldtimer’s Comment: I’ve seen a number of these types of articles. Although the estimates vary depending on the subject area from 400 to about 1500, the word on the street is that the returning soldiers from Iraq and Afghanistan are showing up in shelters much faster than in previous wars. The problem stems from higher rates of PTSD and TBI (traumatic brain injury) which still take too long to diagnose, and which are resulting from the combined effect of IED’s and higher survival rates. The VA has long under diagnosed these problems and only recently, after much heat, begun to actively pursue it. 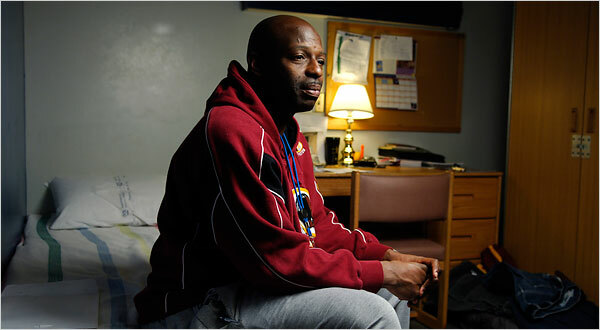 Frederick Johnson, a veteran of the Iraq war, lives in temporary housing provided by the V.A. after spending a year on the streets. WASHINGTON, Nov. 7 – More than 400 veterans of the Iraq and Afghanistan wars have turned up homeless, and the Veterans Affairs Department and aid groups say they are bracing for a new surge in homeless veterans in the years ahead. 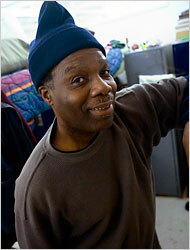 Joe Williams lives in a homeless shelter in Washington. Experts who work with veterans say it often takes several years after leaving military service for veterans’ accumulating problems to push them into the streets. But some aid workers say the Iraq and Afghanistan veterans appear to be turning up sooner than the Vietnam veterans did. With more women serving in combat zones, the current wars are already resulting in a higher share of homeless women as well. They have an added risk factor: roughly 40 percent of the hundreds of homeless female veterans of recent wars have said they were sexually assaulted by American soldiers while in the military, officials said. “Sexual abuse is a risk factor for homelessness,” Pete Dougherty, the V.A.’s director of homeless programs, said. Special traits of the current wars may contribute to homelessness, including high rates of post-traumatic stress disorder, or PTSD, and traumatic brain injury, which can cause unstable behavior and substance abuse, and the long and repeated tours of duty, which can make the reintegration into families and work all the harder. Frederick Johnson, 37, an Army reservist, slept in abandoned houses shortly after returning to Chester, Pa., from a year in Iraq, where he experienced daily mortar attacks and saw mangled bodies of soldiers and children. He started using crack cocaine and drinking, burning through $6,000 in savings. “I cut myself off from my family and went from being a pleasant guy to wanting to rip your head off if you looked at me wrong,” Mr. Johnson said. Poverty and high housing costs also contribute. The National Alliance to End Homelessness in Washington will release a report on Thursday saying that among one million veterans who served after the Sept. 11 attacks, 72,000 are paying more than half their incomes for rent, leaving them highly vulnerable. Mr. Dougherty of the V.A. said outreach officers, who visit shelters, soup kitchens and parks, had located about 1,500 returnees from Iraq or Afghanistan who seemed at high risk, though many had jobs. More than 400 have entered agency-supported residential programs around the country. No one knows how many others have not made contact with aid agencies. More than 11 percent of the newly homeless veterans are women, Mr. Dougherty said, compared with 4 percent enrolled in such programs over all. Veterans have long accounted for a high share of the nation’s homeless. Although they make up 11 percent of the adult population, they make up 26 percent of the homeless on any given day, the National Alliance report calculated. Oldtimer’s comment: My studies show that homeless male veterans make up 43% of the homeless male population, far in excess of what would be expected. According to the V.A., some 196,000 veterans of all ages were homeless on any given night in 2006. That represents a decline from about 250,000 a decade back, Mr. Dougherty said, as housing and medical programs grew and older veterans died. Oldtimer’s comment: Oops! That is a deliberately misleading statement. A GAO report states that the drop from 250,000 a decade ago was due to a major change in how homeless veterans are counted. While it is true that our older veterans are dieing off, many more veterans are joining the ranks of the homeless and make up for it. There has been no real decline, and actually there has been a steady increase in the percentage of homeless veterans vs the overall population of veterans. The most troubling face of homelessness has been the chronic cases, those who live in the streets or shelters for more than year. Some 44,000 to 64,000 veterans fit that category, according to the National Alliance study. On Wednesday, the Bush administration announced what it described as “remarkable progress” for the chronic homeless. Alphonso R. Jackson, the secretary of housing and urban development, said a new policy of bringing the long-term homeless directly into housing, backed by supporting services, had put more than 20,000, or about 12 percent, into permanent or transitional homes. Oldtimer’s comment: I’m not sure where these numbers come from. It appears the HUD secretary is talking about all chronic homeless, not just veterans. 20,000 is 12% of 166,000, which is about right for the chronic homeless for the entire homeless population. To get a feel for progress among veterans, see the following two paragraphs. Veterans have been among the beneficiaries, but Mary Cunningham, director of the research institute of the National Alliance and chief author of their report, said the share of supported housing marked for veterans was low. A collaborative program of the Department of Housing and Urban Development and the V.A. has developed 1,780 such units. The National Alliance said the number needed to grow by 25,000. Mr. Dougherty described the large and growing efforts the V.A. was making to prevent homelessness including offering two years of free medical care and identifying psychological and substance abuse problems early. There is a scary article in the San Francisco Chronicle. The article predicts a flood of new stressed out veterans as they return form Iraq and Afghanistan, many of whom are on the fast track to PTSD, depression, and other mental health disorders compared to previous wars. I’ve reprinted a little of it below, but you can find the rest at this link where it is reproduced in SGate.com. (…) omitted illustrative story about a vet (Tim Chapman) contemplating suicide, find it at the link. First a few facts. Bobby Rosenthal, regional manager for homeless programs at the Department of Veterans Affairs, estimates that one third of the more than 6,000 homeless people – about 2,100 – in San Francisco are veterans. And no wonder the number is so high. California leads the nation in homeless veterans by a mile, according to the National Coalition for Homeless Veterans. The 2006 numbers showed 49,724 homeless vets in California. The next nearest state was New York with 21,147. Now here’s the scary part. Compared with what’s coming, that’s nothing. Roughly 750,000 troops served in the wars in Iraq and Afghanistan, often with multiple tours of duty. Many are only now returning home. But unlike Vietnam veterans, who didn’t begin to demonstrate post-war trauma until five or 10 years after they left the war, this group seems to be on a fast track. It’s been called a health care tsunami. Because not only are the Iraq vets prone to post-traumatic stress disorder (something Chapman has battled) but with improved battlefield health care, far more are surviving traumatic injury. On one hand, that’s good news, but it also means many more vets who are severely disabled, having lost arms and legs. Both factors increase the chances that the returning troops will join the sad ranks of homeless veterans. If history holds, the mayors shouldn’t hold their breath. If anything, benefits for veterans have been restricted. To take one example, many of us think of the World War II G.I. Bill as a shining example of a reward for service, paying for college for vets. But Blecker, of Swords for Ploughshares, says the current version “is in no way, shape, or form near enough” to pay for a degree. For San Francisco, the potential impact could be huge. An influx of traumatized, battle-scarred veterans presents a scary future. Consider the case of Scott Kehler, a veteran of the first Gulf War, who needed years to work through his demons. He recalls passing burned bodies and the constant fear that an explosion would suddenly erupt in the street. (…) omitted a few details, go to link to get the rest. The challenges are unique. Wanda Heffernon, a program and clinical counselor for Ploughshares, said they had a new inductee who slept in the closet. It was the only place he felt safe. Is it any wonder they end up on the street? Kehler battled alcohol abuse, but Chapman is part of the new breed, who turn to methamphetamine. Married when he returned, he lost his wife and all contact with his parents. Eventually he ended up sleeping in an alley.Now drug-free, living at Treasure Island housing, holding down a full-time job, and reconnected with his mother, he is testimony to the idea that peer counseling seems to work. Ploughshares has earned support from Sens. Dianne Feinstein and Barbara Boxer and House Speaker Nancy Pelosi. Imagine the impact it would have on the San Francisco homeless problem if one third of those on street were able to get help and housing. But what the vets don’t have is funding. The VA’s Rosenthal – who gets high marks from local leaders – says the problem is not being ignored. C.W. Nevius’ column appears Tuesday, Thursday, and Sunday. His blog C.W. Nevius.blog can be found at SFGate.com. E-mail him at cwnevius@sfchronicle.com. Oldtimer’s comment: This story illustrates what I’ve said all along. PTSD and TBI are leading causes of homelessness among veterans. It is a rapidly growing problem, approaching flash flood conditions for our heroes returning from Iraq and Afghanistan. A tsunamis of real people, not just numbers, real people with real names. Somebody’s sons and daughters, husbands and wives, fathers and mothers, brothers and sisters. Real people, all in serious trouble, heroes in despair … we should be crying. We should be helping, we should be calling on congress, questioning our candidates. Where is your voice, America?